Last Wednesday, DC's fired off its first salvo of relaunched first issues. Of the thirteen rebooted books, some worked, a bunch didn't, and one debut absolutely knocked it out of the park. That comic was Jeff Lemire's and Travel Foreman's superhero-horror yarn Animal Man. A few of you may be wondering, "Who the hell is this redundantly named Animal Man?" In short, Buddy Baker was an obscure Silver Age superhero who caught his big break in the 1980s, when Grant Morrison made him the star of a metatextual romp through the superhero genre. After Morrison's run, writers like Peter Milligan, Tom Veitch, and Jamie Delano penned the hero until Animal Man wrapped up in 1995. And despite DC writers' propensities to cast Buddy Baker in existentially taxing scenarios, the hero's powers are pure old-school ridiculous. Aliens imbued the hero with the power to tap into the "life web" and borrow the traits of Earth's fauna: the hide of a rhino, the regeneration of an earthworm, the sonic clap of the pistol shrimp, and so on. Animal Man is also a happily married family man with no secret identity, qualities that make him a rarity in the DC Universe. The first thing you'll notice when you open Animal Man #1 is that the comic begins with a fake interview with author Jeff Lemire, who — in a possible nod to Morrison's run — has cast himself as a magazine journalist. Here, Lemire (Sweet Tooth, Essex County) distills everything you need to about the superhero. This intro is informative and cheeky, particularly the bit about Buddy taking a JCVD turn in a superhero indie drama. One of the goals of the DC relaunch is to draw in new readers, so it seems weird that Animal Man was the only DC title this week to have this handy introductory page. For Animal Man — a character who's been on the periphery for 16 years — this faux interview is welcome, as Animal Man isn't a reboot of the character. Buddy Baker has a new costume, but his comic's still steeped in prior continuity. 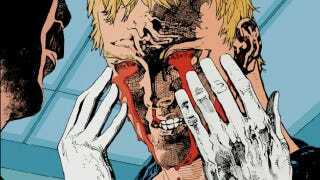 One of the reasons Animal Man #1 works so well is that Lemire plops the reader right down into his daily routine...and then drops the horror in the final act. We meet Buddy's charming family, watch him stylishly foil a crime, and — after a hard night of superheroing — Buddy begins having creepy, hallucinatory dreams. Travel Foreman does a fantastic job with these sequences, which are reminiscent of Scary Stories To Tell In The Dark. Lemire also smartly ties the horror to Buddy's family. Unfathomable cosmic evils are a dime a dozen in comics, but they're way scarier when one of your children is (maybe) possessed by one. I'll be discussing the rest of the DC titles later today, but know for now that Animal Man is the best one yet. Gold stars for the creative team.